The last few months have been hectic, demanding, occasionally rewarding, often dispiriting but generally productive. At the end of August, (to twist the Preface of the Dead) my life was ended not changed when I was appointed bursar of the monastery. My day had been structured, for most of my almost-18 years here, principally around the monastic liturgical horarium. Now it revolves around another sort of office, with computers and files, income and (always-greater) expenditure, staff crises and, most recently, storm damage to the abbey church. Some days I spend up to nine hours in the office. I am out of practice for a “normal” nine-to-five sort of job. Sometimes I manage to use my downtime not in wallowing in problems but in recognizing that people can be surprisingly, and very cheeringly, good. In the past year I have received often surprise gifts of books, fountain pens, handkerchiefs, a bottle or two of something heartening, a floor-standing bookstand, and no doubt things I cannot recall at this very moment. Such gifts never fail to bring encouragement and cheer, and so often they come just when I could do with some! Sinner though I am, I do try to ensure that I manifest my sincere gratitude as directly as possible to my benefactors. It’s been a busy day so just one piece today in the series on Douai Abbey’s Ward vestments. Today it is the cope. A triverberate (!) of Latin words does not make for good “clickbait”, but this is for the serious reader not the passing internet surfer. All will soon be clear enough. 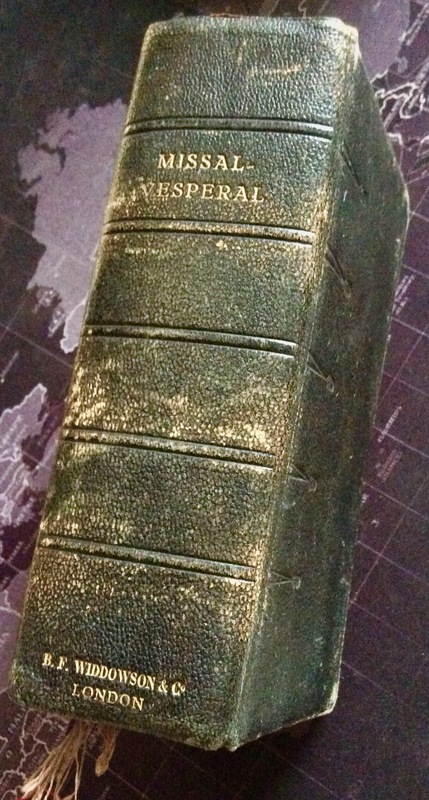 First from the cloister haul is this example of a missal I had not come across before: a Missal-Vesperal. Many of the 20th-century people’s missals began to include vespers and even compline, as a way of bringing the life of Christian worship out beyond the confines of Mass and to imbue daily life with the spirit of the liturgy. This will verge on a megapost. There was quite the variety of missals in the cupboard. As a great lover of the old hand missals I found these of special interest. If the old missals do nothing for your adrenalin levels then this post may not be of interest to you. There is no particular rationale to the following sequence. The first is a representative of the high-water mark of the hand missals for the laity that were one of the great fruits of the authentic liturgical movement. It has an intrguing inscription. Either Christopher is something of an indian giver, or Judie is very possessive. London has been hit by terrorists again, with all the hallmarks of those inspired by the Islamic jihadists of Daesh. The details are gradually becoming clearer now but it seems prudent to withhold comment until we know quite certainly the full nature of the attacks. Of course for now we pray: for the seven dead and commend them to Christ’s mercy; for the injured and commend them to the Spirit of Consolation; for those who mourn or who are afrighted and commend them to the Father’s paternal care. So as we worship this Pentecost day we might remember the victims, pray also for the conversion of terrorists, and offer ourselves to the Father with Christ in solidarity with the persecuted Church in Egypt, Syria, Iraq, and in parts of Africa and Asia. But this is not what the title of the blog post refers to. If I may, a brief pause from the worries of terror.